“You cannot grow the varieties you once grew in a friendlier climate, and also expect big tomatoes . . . That’s for certain! The growing method is different and you need more heat tolerant varieties. My goal is to make it possible for you, for all of us, to have a bountiful tomato harvest, even in the desert heat. We, (my helpers and me; we’re all volunteers), do this through the tomato trials. I trial various varieties of seeds, products and different combinations of growing methods in our desert garden. The tomato trials confirmed that we cannot grow the large fruited varieties we grew in a friendlier climate and expect tomatoes. That’s for certain! About 99% lack the ‘right’ gene. But, after years of searching I found a delicious variety, the Hawaiian Tropic, that can produce lots of huge tomatoes, throughout the hot desert summer, and this is the variety we grow for our own table. I’ve also changed the growing method to improve our harvest. The tomato trials have shown me what needs to be done differently to the plants and soil during the hot growing season. So, I developed a good method for keeping the plants almost totally insect free, more disease resistant and healthier using products we trialed. The new growing method I developed during our tomato trials is different than you have been using. It’s not more difficult, in fact it is easier. Easier in that you will have healthier plants and less to no disease nor insect infested plants to manage. In fact, you may experience the benefits of 160 pounds of delicious tomatoes like we picked from two test plants, with no disease or insect damage. 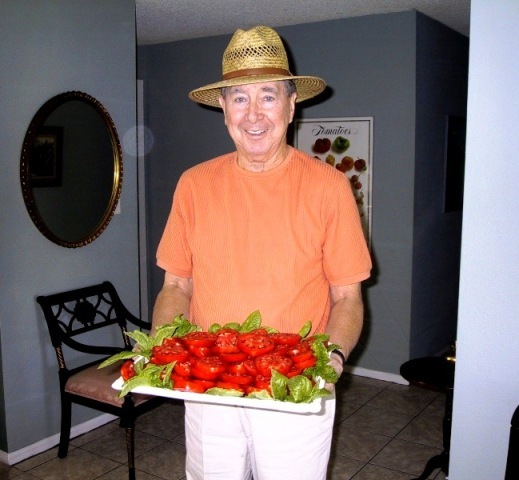 Look in the products section for my book, “Growing the Tomato in Las Vegas in Terrible Dirt and Desert Heat.” It tells the story of how we finally grew them, what we did and how we did it to be able to pick wonderful tomatoes in the heat of a Mojave Desert summer. You will be amazed at how easy it is to grow big tomatoes using my new method. Visit the Sweet Tomato Test Garden. Someone, usually me, is here all daylight hours and we all love visitors. While you are here you can purchase the same gardening products and my carefully blended compost we use here – we call it Tomato Lady Soil. Please phone first, I don’t want to miss visiting with you. Phone: 702-490-5217. I, and other experts in their field, are teaching you how to grow and manage a productive garden in classes that are held right here at the Sweet Tomato Test Garden. You can sign up for classes at my Desert Gardening School right here on this website. Also, ask to receive my monthly email Gardening Newsletter – it lists the class schedule for the Desert Gardening School and gives timely gardening tips and some other useful info. Classes are free to fee – some classes have a fee when they include seeds, soil and materials I have to buy, like my popular Seed Starting Classes – those classes have to be the biggest money saver of the century.